I got this inspiration from the concept of swales and how they permit water to be leached slowly into the earth for use by trees and plants. I had just planted a pepino cutting by a fence in a very, very dry part of my garden and as we approached summer it was becoming evident that the spot was ideal as far as sunlight was concerned, but even the well-established rosemary was starting to turn up its toes. The house block slopes to the north and this particular garden bed is really well drained and largely just sand. I have refused to water the garden with tap water since we moved in and my grey-water set-up did not really prove to be that successful or effective or time-saving. I wanted a simpler, workable way. So I ripped out the grey-water pipes and created what I call a micro-soak. Firstly I dug a large hole, around half a metre deep in to the water-repelling sand and probably 60-70cms wide. I then lined it with sheets of newspaper and put in an up-turned pot plant that had the bottom removed. Around the pot I layered up torn cardboard pieces, more newspaper, grass clippings and you could also used hay and pea straw if available. I wet this all down with grey-water as I added material. Then on top I mounded it all up with more grass clippings and tipped in a bucket of water into the channel that the pot made. This water took some time to seep through the paper but I added water occasionally as I passed and eventually just added a bucket of water a week or whenever I saw fit to. Fairly quickly the paper began to break down and worms were drawn to the moisture and the feed of grass, cardboard and organic material. It was all down-hill from there really. The worms broke the material down and the water gradually moved out into the garden and by this time the surrounding plants would have had roots close to the source of moisture. In some cases I guess you could removed the pot altogether and just continue to pile up fresh organic material as the soil underneath is now a sponge that holds the water and feeds it through to the plant roots as it soaks away. These areas are full of worm activity and the pepino and rosemary not only survived the hot, easterly-driven summer, but thrived with the extra heat and the readily available water supply that really wasn’t that generous in quantity but was simply being used more effectively. I set up another micro-soak up hill from the first and this really feeds the rosemary as it is up hill from it. It also means I have been able to take a cutting from the pepino and plant it alongside the mother plant to create a wall of green in an area of the garden that was otherwise dry – and I should say, had remained dry even though the previous occupants of the house had reticulated the garden and watered on a timer. In choosing to retire the reticulation system and find other simple solutions for our watering I have found that this simple idea has created mini-oasis areas in the garden. I am taking this a step further now and have created two other experimental micro-soaks. One has had a large amount of cardboard placed on top of it upon which a compost bin has been placed. The other I have place a large metal drum with the ends cut out and this is planted with seed potatoes that I am adding hay and pea straw and shredded newspaper to as the plants grow up-ward. I have heard mixed results about this style of growing potatoes but have always wanted to try it and the idea itself makes sense in our small garden. If I can grow more, vertically, then I will give it a go! In just the six months or so that I have had the micro-soaks set up the soil life in the areas of the garden where they are has exploded. I certainly plan to duplicate the success on the other side of the house in a similar situation where the garden bed receives even less water due to its situation and reduced amount of human traffic. In the picture above the center of the soak is a little to the right of the pink strawberry pot. You can see it slopes down a little towards the path. 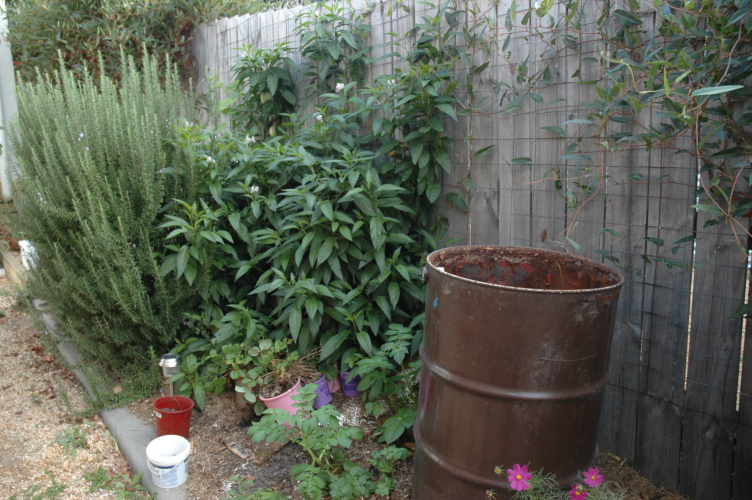 Another soak lies behind the rosemary bush and one under the brown drum which now has potato plants growing up through it. Behind this along the fence there are sweet peas coming up which are in a much drier spot due to being further from the soak and not having such a huge root system at the moment. These are getting hand watered when I think of it. Potatoes, beetroot and cosmos are growing in the vicinity of the drum soak. Having survived a hot summer it is a little easier now as we will have autumn showers to supplement the watering.